Baalbek (بعلبك‎ or Baʿalbek in Arabic) is a city in the Bekaa valley in central Lebanon at an altitude of 1150m. 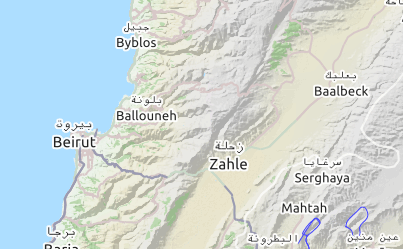 The Bekaa (or Beqaa) valley is predominantly Shiite and Baalbek is considered a stronghold of the Hezbollah movement. As such, both Baalbek and the Bekaa valley are in the travel advisories of many countries, although travel to these places is perfectly safe. The main reason to visit Baalbek is the Roman temple complex. This has been a UNESCO world heritage site since 1984, due to the outstanding artistic value and excellent preservation statues of the temples. 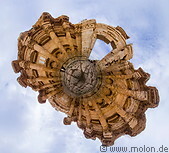 In ancient times the Phoenician city was known as Heliopolis during the Hellenistic period. When the Romans took over Lebanon they further developed the religious site with additional temples. Currently the site consists of the ruins of the temple of Venus, which are located outside of the fenced compound. Within the compound, the first structure is the Propylaea followed by a hexagonal court. After this comes a large court with ruins of buildings and columns. To the rear are the ruins of temple of Jupiter. On the side is the temple of Bacchus, which is the best preserved structure in the Baalbek temple complex. 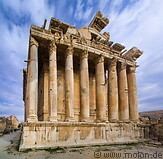 Baalbek can be reached by car (87km, 1:30-2:00 hours), bus or shared taxi from Beirut. It can be done as a daytrip from Beirut, although it is advisable to base oneself in the Bekaa valley, for instance in Chtoura. Accommodation in Baalbek is relatively limited. It is better to stay elsewhere in the Bekaa valley, or to come from Beirut.